Ford Mustang driver Russell Wright has won the second round of the 2018 Performax TA2 Muscle Car Series at the Ipswich Festival of Cars at Queensland Raceway. The 2017 TA2 Queensland champion scored three race wins from the four on offer, to claim overall round honours ahead of Craig Harris (Mustang) and Hugh McAlister (Mustang) to secure a Mustang podium lockout. Switching to a Dodge Challenger for the weekend, round one winner Ashley Jarvis set a 1:15.8818 on his final lap to earn pole position by over five-tenths of a second to Wright (1:16.4651), followed by Harris and Cameron Sendall (Camaro) on the second row of the 14-car grid. Jarvis lead comfortably from the outset before an alternator issue parked the Dodge on lap ten, handing Harris his first race win of the year after a tense battle with Wright, who dropped back to sixth after spinning at turn six on the fifth lap. Sendall scored his personal best finish of second, with Hugh McAlister edging out father Ian McAlister (Mustang) to the final podium spot. Harris lead early in race two before a mid-race rain shower resulted in a spin through turn one on lap six leaving Wright to take the win ahead of Jarvis, who stormed through the field in slippery conditions to pass 13 cars to place second following his race one DNF. Jarvis beat Wright off the start in race three before he received a drive-through penalty for a jump start, as Wright scored another win ahead of a hard-charging Harris and Hugh McAlister. 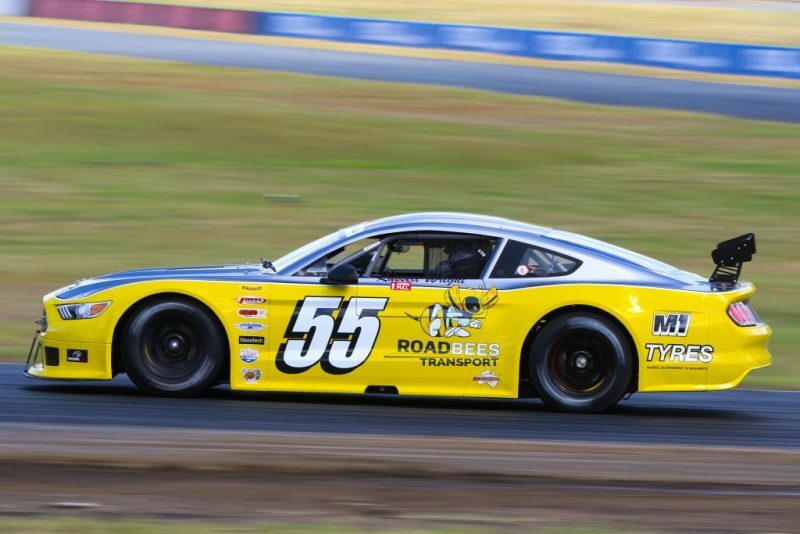 Harris and Sendall fought tooth-and-nail for the minor placings, before Sendall spun at turn two on the final lap and dropped back to sixth behind Don Dimitriadis (Mustang) with a personal best fifth place. Wright scored a green-to-flag win in the final race, leading home Harris and Ian McAlister. Bouncing back after a troubling weekend at the Winton opener, Wright was delighted to return to the top step of the podium. “I was really happy that I could hang on for three wins in the last three races. The tweaks we made to the car made it much easier to drive, it wasn’t any faster but it was more stable under deep braking,” said Wright. “Ashley [Jarvis] had an unfortunate weekend after the DNF in the first race which put him back. I think it would have been a different weekend had he not had that problem in the first race, but we’ll take it when we can get it. “The category is growing and every round we go to it’s getting bigger and better, and harder and harder to stay at the front. Hugh McAlister (184 points) now holds a one point lead in the 2018 Performax TA2 Muscle Car Series over Russell Wright (183 points) and Craig Harris (172 points). The TA2 Muscle Cars head south for round three for the annual Muscle Car Masters at Sydney Motorsport Park on June 8-10.